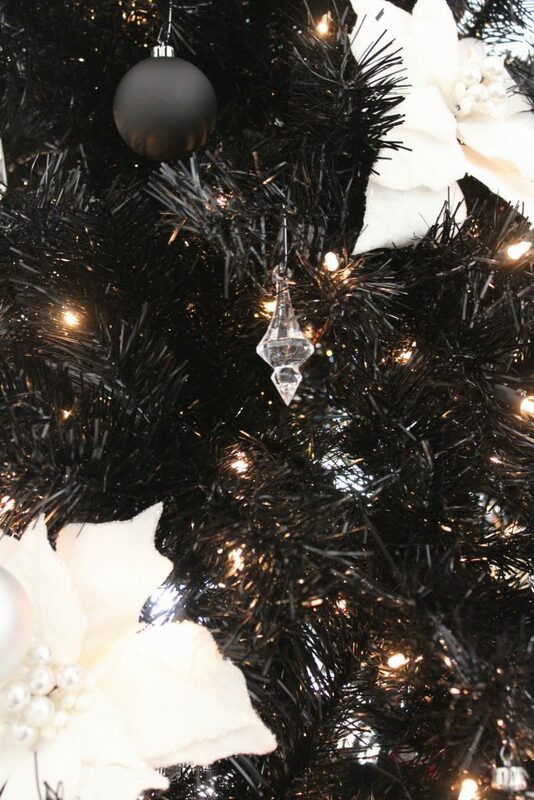 Switch up your traditional Christmas tree for one that’s classy and glamorous like this black Christmas tree! 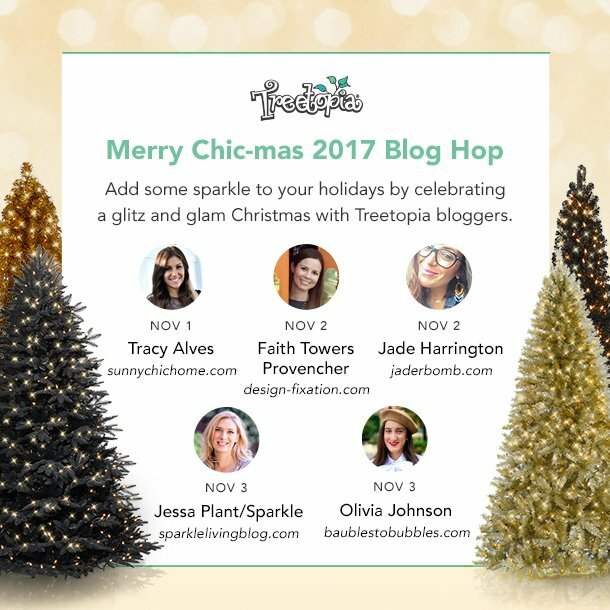 I am so excited today to be part of Treetopia’s Merry Chic-mas Blog Hop! I was sent a tree, a wreath and some tabletop trees and I can’t wait to show you them. All opinions are 100% mine. 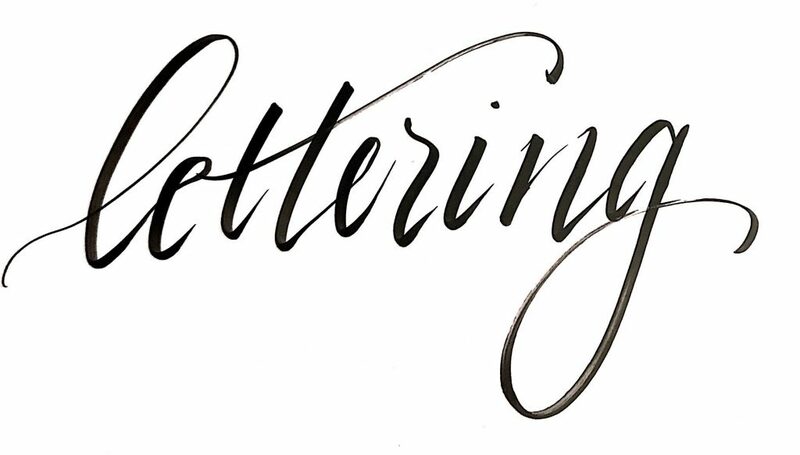 Be sure to scroll to the bottom to check out the other blogs and enter the giveaway! Don’t adjust your screens! 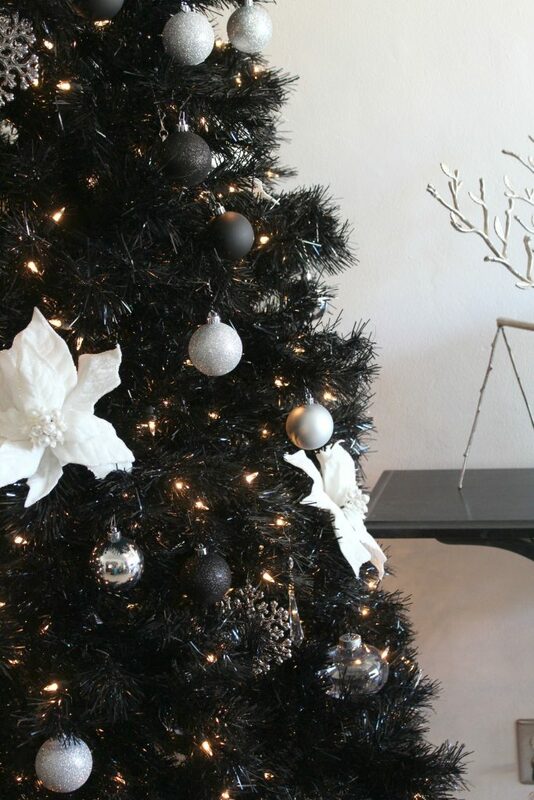 This Christmas tree is black! It’s black and shiny and glamourous. The Mr. and I have spoken about a black Christmas tree before, so when the opportunity to get one came up, I went for it. Don’t get me wrong, I was a little nervous. It is quite unconventional, and I was afraid it would come across too goth or Halloweeny (since it can absolutely be used for both), but with the right decor this black Christmas tree is quite extraordinary. My home has a ton of natural light and is very bright, literally a full wall of windows, so the black tree looks quite dramatic with all the brightness. This tree is called Tuxedo Black and the needles are tinsel so they help reflect the light. 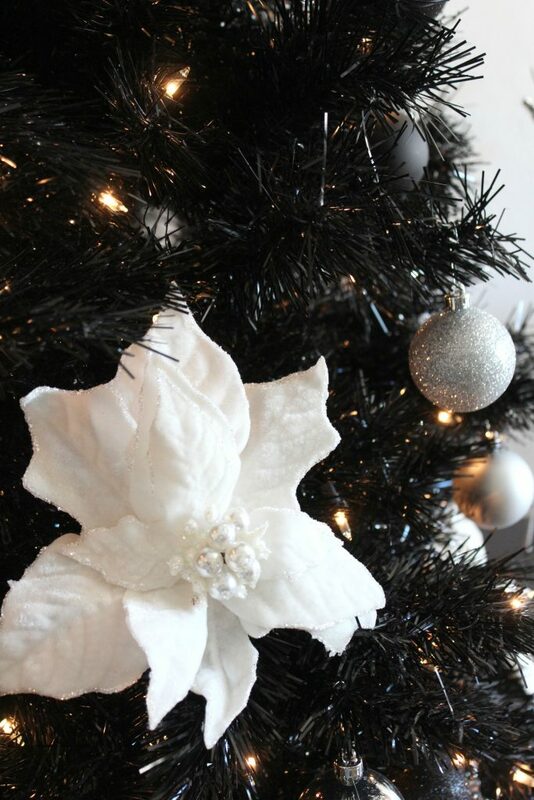 Going with the tuxedo theme, I decided to decorate this tree very black tie and fancy, starting with jeweled white poinsettias. The addition of little crystal ornaments to resemble jewels and to add sparkle. For the balls I added matte and glittery black, to add some depth to the tree; as well as silver and clear for more sparkle. This tree is tall! At 9 ft it nearly touched the ceiling, so I topped the tree with those gorgeous jeweled white poinsettias and some silver and jeweled spray, found in the floral department at the craft store. What is a black tie party without a well stocked bar cart? I wouldn’t call this bar cart well stocked, but I would call it gorgeous! 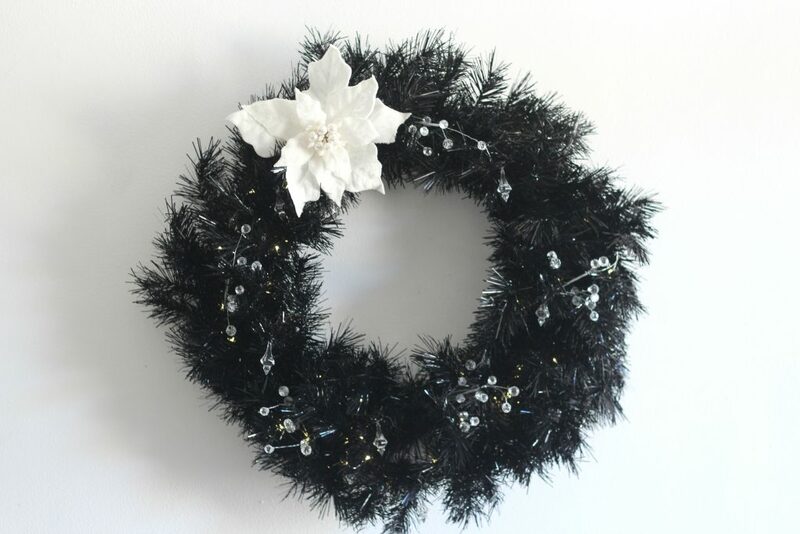 The 30 inch Tuxedo Black wreath came unlit, so I added some battery powered micro LED lights. I attached some crystal ornaments using floral wire and added crystal floral spray and another white jeweled poinsettia. Related: Love poinsettias? Make this Sculpted Clay Poinsettia Ornament. The Tuxedo Black tabletop trees are my favorite! I love the idea of mini forests and this particular mini forest is full of wine! The tabletop trees came as a set of three, with two 18 inch trees and one 24 inch tree. These tabletop trees also came unlit, so I added some micro LED lights to the tall one and added crystal ornaments to the smaller ones, to tie in to the wreath and the tree. 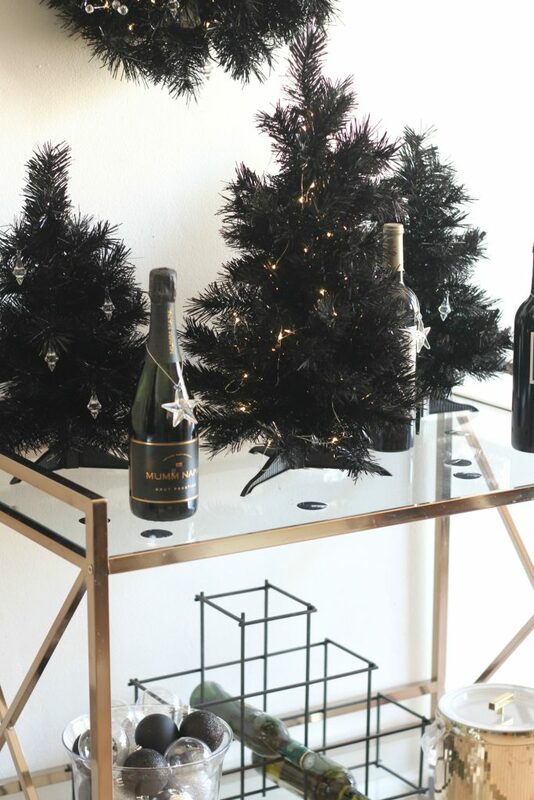 It all looks very classy on the gold and glass bar cart! 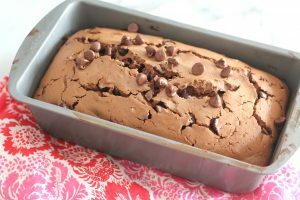 Be sure to visit my friends on this Blog Hop! 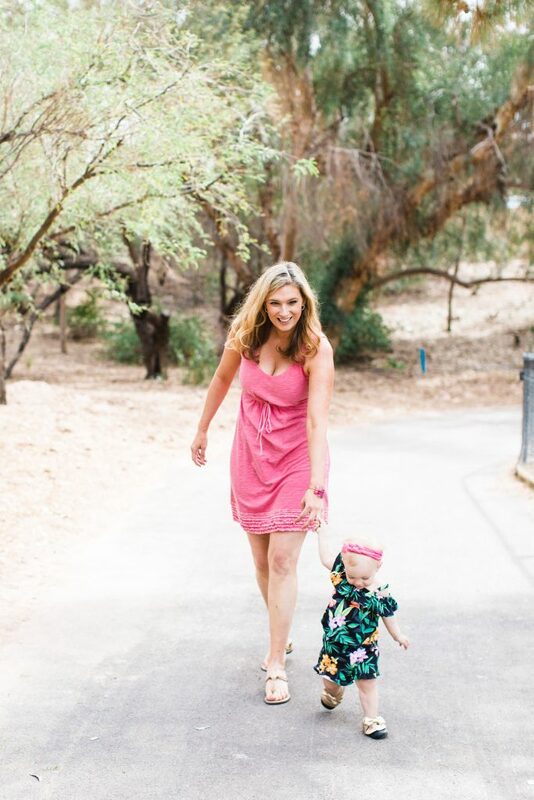 You are going to love these trees! 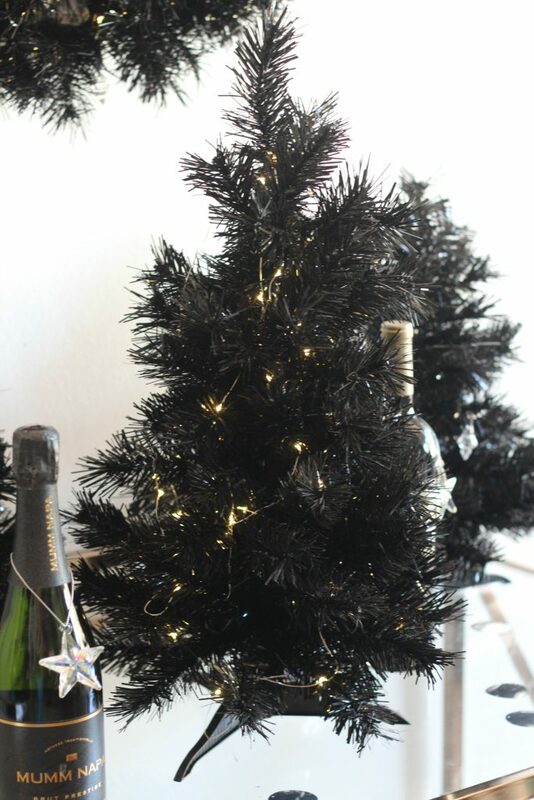 Would you want a Tuxedo Black Christmas tree in your home? If so, then today is your day! 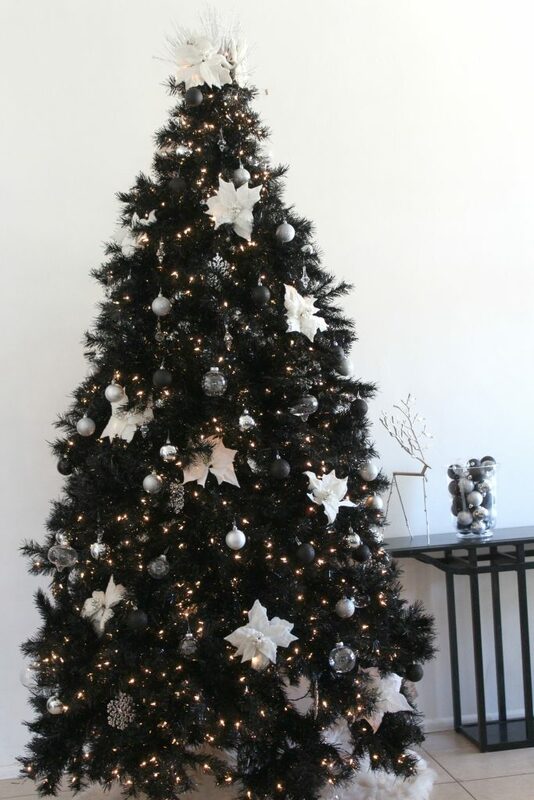 Treetopia and I are giving away this 9 foot Tuxedo Black Christmas tree to one lucky winner! 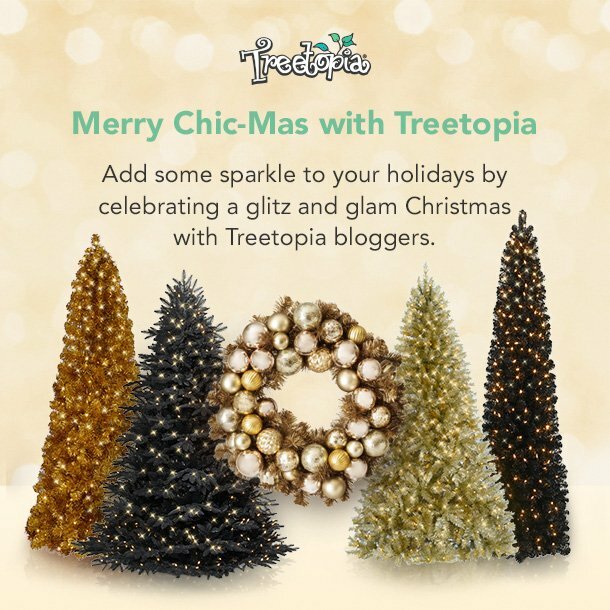 Follow Treetopia and Sparkle on Instagram and enter below. Plus, there are opportunities for bonus entries! I love it! 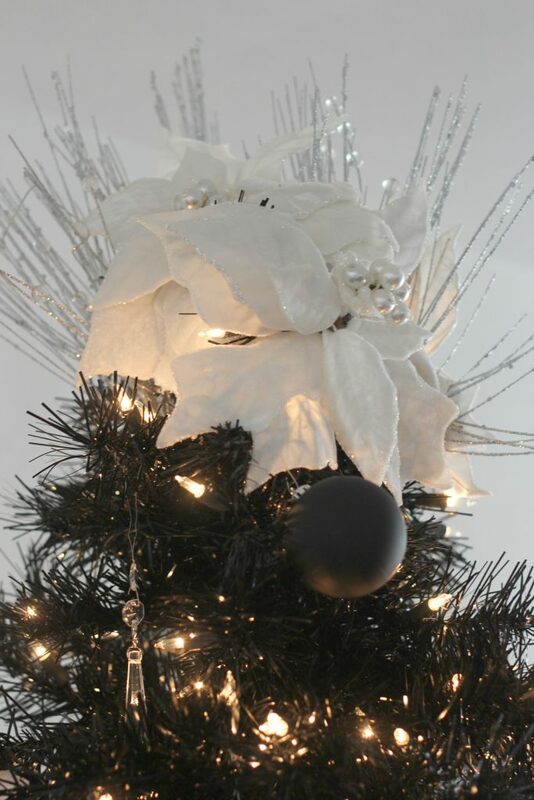 I did a black & white tree in my office last year to match my rocker-glam theme. 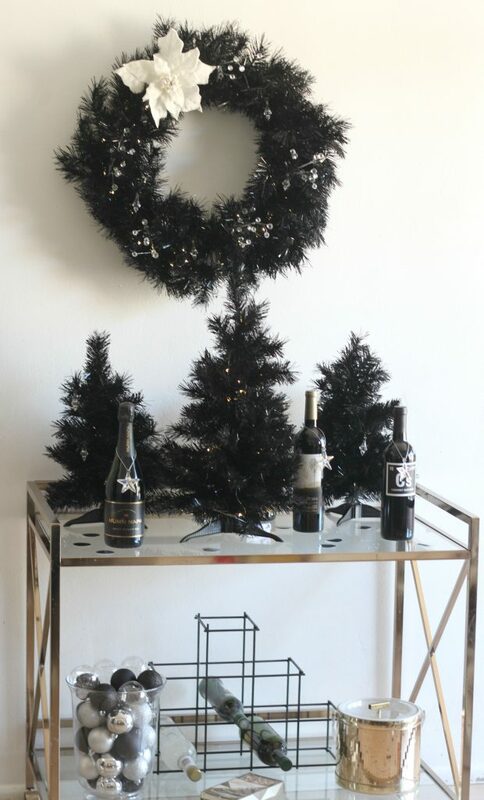 I love how versatile a black tree can be!